There are even measures that you can take which will go unnoticed in your everyday life, but will make a big impact environmentally. Swapping the products in your home for environmentally friendly alternatives is simple, yet effective. Take a look at some of the examples we’ve put together and consider opting for these products in your effort to become more eco-friendly. Burning wood for warmth may seem like an antiquated idea, but it’s one of the most efficient and environmentally friendly options. The carbon dioxide which is released by wood as it burns is equal to the amount the tree has converted to oxygen, so it essentially doesn’t have a carbon footprint. There are several things to consider about having a log burner. Firstly, does your home have space for one? 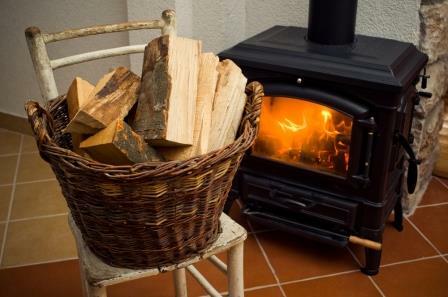 Equally important: do you have a flue or chimney which can accommodate a log burner? What’s more, residential areas sometimes have restrictions on whether you can use a fuel burner which produces smoke. The easiest way of finding out whether this applies to you, is by getting in touch with your local authority or council. The ways in which you clean your home can have a negative impact on the environment. Cleaning products may be a great way of getting rid of grime, but they also release harmful solvents in the air whenever we use them. It stands to reason that this can’t be good for your health either. One of the simplest changes you can make is to opt for specially designed products, which are made from natural materials. Ecover Direct offer some really great eco-friendly products made from materials which have a minimal impact on the environment, plus their packaging is completely recyclable and the brand are firmly against animal testing. It’s also possible to make your own cleaning products. Everyday household items like lemons and salt have fantastic cleaning and antibacterial properties, and are completely safe to use. This is especially useful if there are small children and animals in your home. One way of being friendlier to the environment is to use products made from recycled materials. You won’t even notice the difference and the cost, and quality, of recycled products is usually the same as other options. You can find a selection of recycled products at Traidcraft, including glassware, tissue paper and even leather wallets made from recycled materials! You should also ensure that you recycle your household waste. Local councils are making it even easier to recycle these days, collecting recycling bins from your door along with other household waste; there really is no excuse not to do it. When the interior design of your home is in need of some TLC, don’t assume that you need to throw away your old furniture and buy brand new. Wooden furniture can be given a new lease of life when stripped and repainted; you can even be environmentally friendly when you choose your paint. Nutshell Paints are a UK supplier of decorating supplies and paint, which are free from harmful solvents and emissions that are damaging to the environment. Using networks like Freecycle is also a great place to find unwanted furniture which can be transformed with a bit of attention. As the name suggests, the items advertised on this site are free and you’re being eco-friendly by recycling used items. Some of the simplest choices are also the most innovative. Instead of scribbling things down on pieces of paper and notepads, invest in a cheap and efficient alternative. Chalkboards and whiteboards are perfect for hanging in the kitchen or home office and are handy place to jot down phone numbers and memos. Being environmentally friendly doesn’t have to be difficult. These simple measures won’t impact your everyday life, but you’ll be doing your bit for the planet and invariably saving yourself money in the process!